A delicate chain necklace set with a beautiful heart pendant crafted from classic 9ct yellow gold. The heart is generously embellished with striking square emeralds, finished with glittering diamond edges. Gold jewellery with a dash of rich elegance. 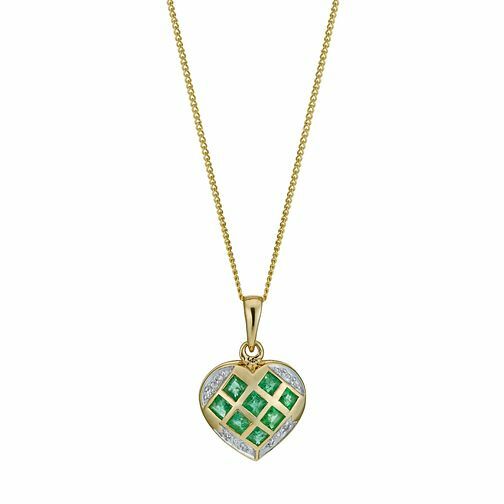 9ct yellow gold emerald & diamond heart pendant is rated 4.7 out of 5 by 7. Rated 5 out of 5 by Anonymous from Valentines gift I bought this necklace for my fiancé for Valentine’s Day, emeralds are her birthstone so with that and the design I felt it perfect for the day. My fiancé loves it. The quality is very good at the price point and the chain and pendant are a reasonable weight. Very happy with this purchase.